Here’s a design tip that’s handy for cabinet shopping. One of the details you’ll select with cabinets is the base profile. 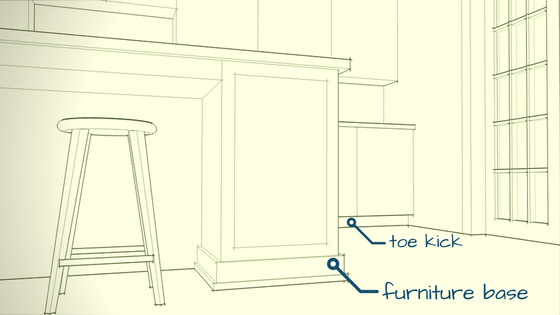 Most kitchen cabinets are designed with a toe-kick. This is a 4” space at the bottom of the cabinet that recedes from the face to allow room for your toes (so you can stand closer to the cabinet and countertop during food preparation). Typically, a toe-kick is an appropriate detail. However, if you’re planning on an island in your kitchen and you want it to look like a furniture piece, you should opt for furniture base. Furniture base does not recede. Instead, as the name would suggest, it mimics a profile typical of furniture or wall base (a couple of trim pieces that trace the bottom). There is no extra toe room provided by furniture base, but we haven’t found this to be a major issue for people. In fact, as I write this, I’m standing at my workstation which is a desk surface above a cabinet with no toe kick. Going for the furniture look? Go with furniture base! We're a husband and wife architecture firm located in Knoxville, Tennessee. We specialize in renovating historic homes for modern lifestyles. HGTV, HGTV Urban Oasis, HGTV Urban Oasis Giveaway and their associated logos are trademarks of Scripps Networks, LLC. Photos © 2017 Scripps Networks, LLC. Used with permission; all rights reserved.